The Bismarck palm tree (Bismarckia nobilis) is a stately fan palm desired by gardeners due to its mighty appearance as a specimen tree. The blue-green fronds make this palm stand out among its cousin palms. Bismarck palms are quite hardy trees once established, and can obtain a height of over 40 feet. 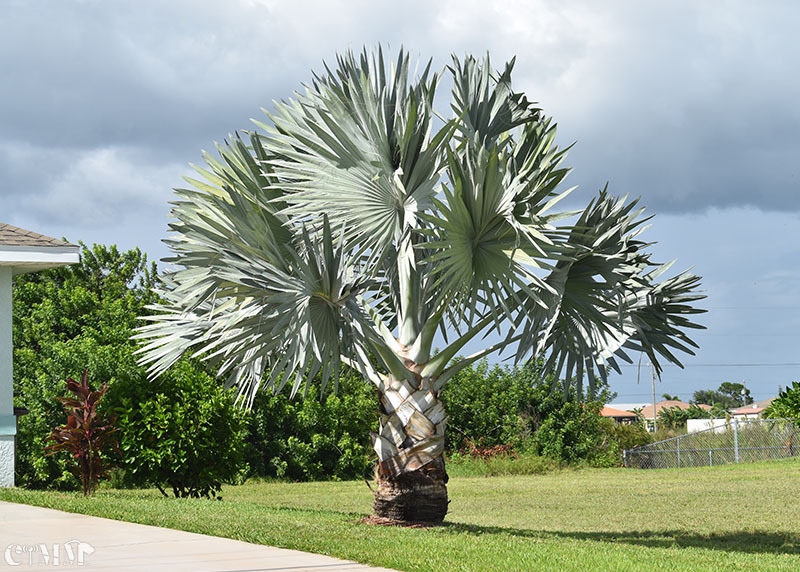 The requirements for planting a Bismarck palm are similar to those of other palms. Bismarckia nobilis grows from solitary trunks, gray to tan in color, which show ringed indentations from old leaf bases. Trunks are 30 to 45 cm in diameter, slightly bulging at the base, and free of leaf bases in all but its youngest parts. In their natural habitat they can reach above 25 meters in height but usually get no taller than 12 m in cultivation. The nearly rounded leaves are enormous in maturity, over 3 m wide, and are divided to a third its length into 20 or more stiff, once-folded segments, themselves split on the ends. The leaves are induplicate and costapalmate, producing a wedge-shaped hastula where the blade and petiole meet. Petioles are 2–3 m, slightly armed, and are covered in a white wax as well as cinnamon-colored caducous scales; the nearly-spherical leaf crown is 7.5 m wide and 6 m tall. Most cultivated Bismarckias feature silver-blue foliage although a green leaf variety exists (which is less hardy to cold). Step 1: Select an area in your landscape that is large enough to allow the Bismarck palm to achieve its full height and width. Step 2: Choose an area that receives either full sun or partial sun conditions throughout the day. The palm can tolerate some shade, but requires at least four hours of direct sunlight to grow properly. Step 3: Plant the Bismarck palm in soil that is sandy and drains well. Amending the area with organic material such as compost is not a requirement for the palm to grow well. Step 4: Dig a hole that is twice as large as the Bismarck palm's root ball but is no deeper. Loosen the soil so the roots will not have a hard time establishing themselves in the new planting site. Step 5: Place the root ball into the hole, making sure the tree is standing straight. Fill the hole halfway with soil and pack it down firmly. Step 6: Water the Bismarck palm well once planted. Continue watering the newly planted tree two to three times per week for the first three weeks. Continue with regular watering approximately once per week thereafter. Step 7: Fertilize the Bismarck palm with a quality palm fertilizer six weeks after planting. Continue with a fertilization schedule of three times per year. Apply in early spring, summer and fall.